Hawthorn Cottage is a pretty cottage nestled in the foothills of the Sperrin Mountains. The cottage is situated on the edge of the small village of Greencastle, a short stroll from the nearby supermarket and pub (3-4 minutes). It has recently been renovated and has every modern amenity you would hope for. A haven ‘away from it all’, Hawthorn Cottage is still only a short drive from historic sites and local attractions. We are only a day trip from The Giants Causeway and North Antrim coast, the historic city of Derry, The Lakes of Fermanagh, the vibrant city of Belfast with its newly opened Titanic Quarter and County Donegal with its unspoilt beaches, bays, headlands and rugged landscape. The local archaeological sites include the Aughascribba ancient Ogham Standing Stone which is within walking distance. The scenic surrounding countryside provides plenty of opportunity for those who enjoy walking or cycling or simply want to take in the natural beauty of the area. Hawthorn Cottage is cosy and warm. The master bedroom has a king-size bed and wash stand. The second bedroom contains one single bed and a ‘day bed’ which can be extended to form a double bed. The sitting room has a double sofa-bed and an open fire, TV-DVD player and plenty of books and games. The kitchen has a dishwasher, fridge/freezer, large cooker and family dining table. The utility room has a washing machine, dryer, microwave and ironing facilities. The bathroom is spacious and has a roll-top bath, heated towel rail and a separate power-shower. There is a garden to the rear containing garden furniture and fruit trees. If you like eggs for breakfast, our friendly hens are only too happy to provide – but watch out for the rooster! 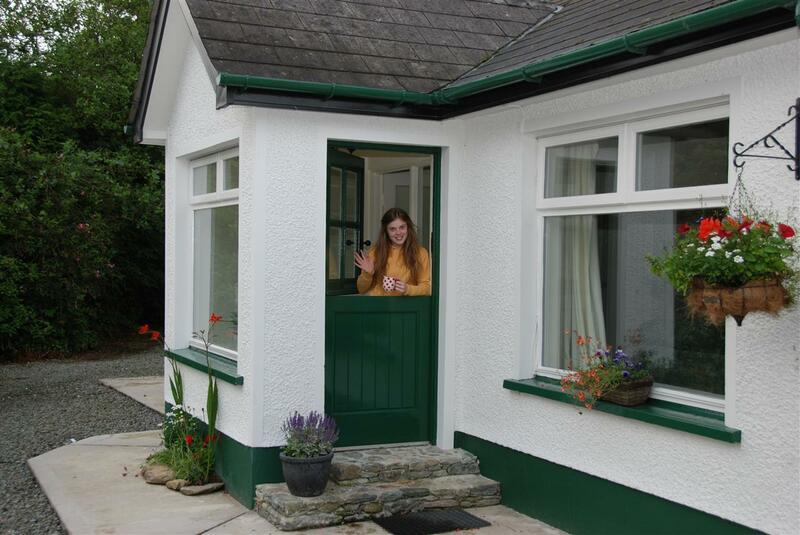 We hope you can wind your way to our cottage door and spend a relaxing holiday or short break at our cottage – where a very warm welcome awaits you! Nightly rates also available, please contact us for details. Table tennis table in room next door in stone cottage in photo.